Syzygites megalocarpus is a mycoparasite, a fungus that feeds on other fungi. Other examples include Spinellus fusiger, Syzygospora mycetophila, various members of the genus Hypomyces (e.g. Hypomyces lactifluorum, which creates lobster mushrooms), Entoloma abortivum, and Boletus parasiticus. Check 'em out, they're all interesting! Unfortunately for us, victims of S. megalocarpus include edibles such as Agaricus bisporus (button/cremini/portobello mushrooms), morels, boletes, matsutake, and oyster mushrooms (genus Pleurotus). Mushroom producers, like their plant and animal growing kin, are constantly searching for ways to improve their product. This can lead them to do things like cross wild and commercial strains of a mushroom-producing fungus in an attempt to acquire desirable traits from the wild partner. However, this approach risks the introduction of hidden detrimental traits possessed by the wild strain. For example, a mushroom producer in Pennsylvania (mushrooms are a hugely valuable crop in this state) recently created a new brown hybrid version of Agaricus bisporus by crossing a wild strain with a commercial one. Unfortunately, it appears this new hybrid is more severely damaged by infection with S. megalocarpus as compared to commercial white button mushrooms, which are relatively resistant. S. megalocarpus was named by Christian Gottfried Ehrenberg, a super intense 19th century German scientist who was responsible for naming vast swaths of animals, plants, fungi, and other microscopic eukaryotes. Dude makes me feel seriously bad about my personal contributions to science. 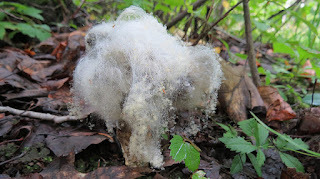 The fungus can grow very rapidly (e.g. can appear overnight), starting out white but changing to yellow or gray with time. It's an interesting one to spot out in nature because it's filamentous appearance is a reminder of what hides beneath the mushroom it is attacking. Mushrooms are only one part of a fungus, a relatively large structure designed to produce and distribute spores. 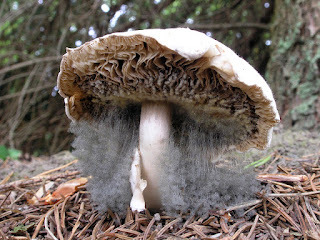 A mushroom develops from a network of filaments (collectively called mycelium) that course throughout various media such as soil, poop, wood, or living animals. The filaments of S. megalocarpus are neat in that they often don't branch off until the very end. Spores are formed at the ends of these branches. The fungus holds the particular distinction of being the first fungi reported to be capable of sexual reproduction (fungi can propagate both sexually and asexually). In 1820, Ehrenberg made the observation that two filaments of S. megalocarpus occasionally interacted with each other to form a black zygosporangium, a structure in which spores (fungus seeds) resulting from sexual reproduction are formed. Among fungi, S. megalocarpus produces a relatively high proportion of gamma-linolenic acid (GLA), an omega-6 fatty acid, compared to other fatty acids. This discovery resulted in a fleeting interest in developing it as a commercial source of GLA. For now, it just remains a thorn in the side of the mushroom industry. Ainsworth GC. 1976. Introduction to the History of Mycology. Cambridge University Press. Kovacs RL, Sundberg WJ. 1999. Syzygites megalocarpus (Mucorales, Zygomycetes) in Illinois. Transactions of the Illinois State Academy of Science 92(3-4):181-190. Weete JD, Shewmaker F, Gandhi SR. 1998. γ-Linolenic acid in zygomycetous fungi: Syzygites megalocarpus. Journal of the American Oil Chemists' Society 75(10):1367-1372.